Thursday's attacks on Muslims in Christchurch, New Zealand, have sparked calls in Oregon for stepped-up efforts against white supremacists, gun violence and hate crimes, while also sparking debate about the limits of free speech. The March 14 attacks by a white supremacist Australian man — which left 49 dead and 48 wounded as of Saturday — caused activist groups including the Oregon Council on American-Islamic Relations to call for Congressional hearings on far-right groups. U.S. Sen. Jeff Merkley also took up the cause. "The horrific attack in Christchurch is the latest proof that white supremacy isn't just a vile ideology," he said. "It's a growing and deadly threat, especially to communities of color. The House and Senate should hold hearings on far-right extremist terrorism and what we can do to combat it." 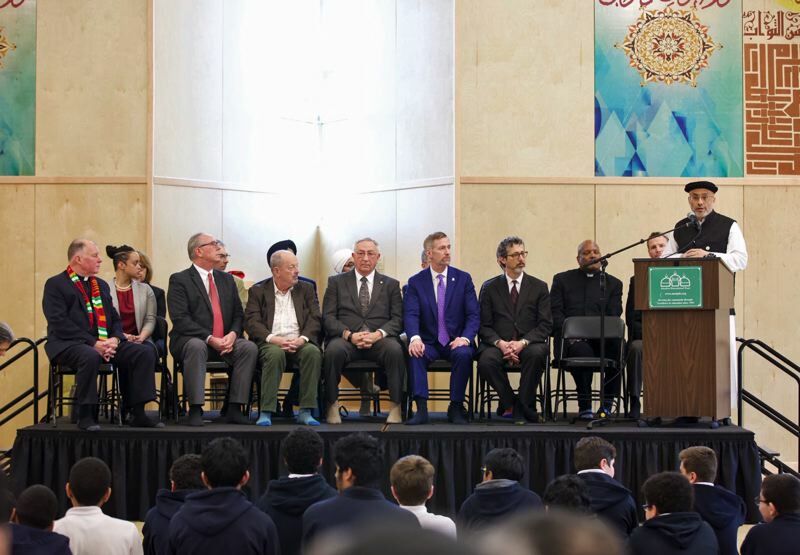 The killings also sparked talk of sorrow and unity At an event Friday at the Muslim Educational Trust in Tigard featured speeches and prayers by local religious leaders, elected officials and others before an audience of more than 150, including a group of students from the trust's affiliated school. "It is very important for people of goodwill to stand, to stand and stop and say enough is enough," said Wajdi Said, president of the trust. "Enough is enough. It is very important that we say we choose love, we choose harmony and we refuse to be enemies." "We come together over and over and over to grieve and mourn and cry and pray and love," said Multnomah County Chair Deborah Kafoury. "But it gets tiring. And I'm scared … but that's exactly what the forces of evil want us to feel. "… What they don't want to happen is this: they don't want us coming together," she said, "They don't want us reaching out and grabbing the hands of our brothers and sisters because they know that we are strong when we are together." Portland Police Chief Danielle Outlaw directed her comments at the assembled students sitting on the rug in the center of the hall. "I want it to be very clear to the future leadership of our world: we are here to protect you and keep you safe," she said. "I want you to know that, during these times, keep your head up. We aren't going to allow anyone to continue to target us out of hatred, out of bigotry, out of every phobia that you can think of. We aren't going to allow that to continue to happen." While much of the event consisted of prepared speeches and prayers, raw emotion was evident. Speakers' mention of gun control sparked some of the loudest applause lines. "We need to elect people to public office who will fight the NRA and fight big money," said former Portland Mayor Tom Potter. "We don't need all those guns, we don't need all that hate." Despite veiled references to the current administration, U.S. Attorney Billy Williams drew strong applause when he announced he and other federal officials have been working a possible new federal law to make domestic terrorism a crime. "We don't have one," he said. "We need one." Calls to mobilize against hate speech generated applause but also words of caution from Williams, as well as Attorney General Ellen Rosenblum, who stressed that new legislation she's been working on for a hate crime hotline will let people seek help and comfort. "As we all know it is not necessarily a crime to speak bad words and say hateful things," she said. "In fact, it can be protected by our Constitution. But it's still very hurtful ... and it causes anguish in individuals in communities." Portland Mayor Ted Wheeler said, "To our Muslim friends, I want you to know this: Portland stands with you. We support you, and we love you."